In February of 1936, Dr. Ferdinand Porsche designed a civilian car for use on the German Autobahn. Surprisingly, almost none of these cars were made available to private citizens. The Wehrmacht began secretly appropriating these vehicles for military use. In January 1938, the Wehrmacht presented Dr. Porsche with the specifications for a military version. That November, the prototype was completed and designated the Pkw. K1 (VW-Kubelwagen). The Kubelwagen Type 82 was equipped with a lightweight monocoque body on a torsion bar spring based four wheel independent suspension. Its powerplant consisted of an air-cooled four cylinder 985cc engine, which outputted 23.5hp. Its tremendous performance led to its wide use as a communications vehicle by Wehrmacht units. 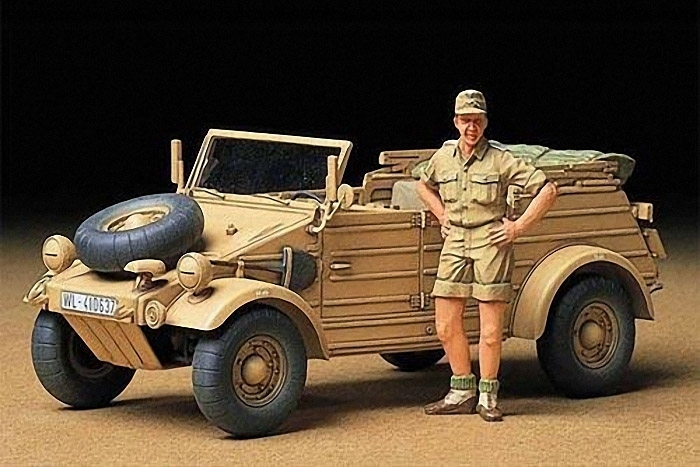 Because of its reliability and ease of repair, and since its engine did not require a coolant, the Kubelwagen proved particulary effective in North Africa. At the request of various divisions in North Africa for a vehicle suitable for the desert, a Continental balloon tire equipped version went into production from 1942. Two types of balloon tires, a grooved and an ungrooved version were used. Because the tires were wider than normal tires, a spacer to raise the height of a spare tire attachment was added to the hood of the car. Some of the balloon tire equipped Type 82 were even used in Italy after the fighting in North Africa stopped in May of 1943. Including variations, about 51,000 Kubelwagen Type 82 were produced by the end of the war.